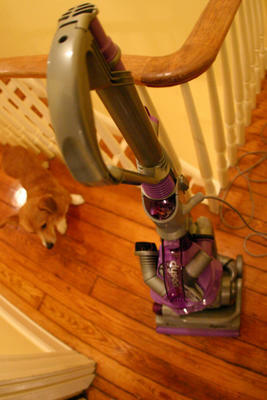 Ladies and Gentlemen, I present to you our Dyson Animal, which we have named Manimal. Manimal was looking forlorn at the store. He was all alone on the shelf. The Mr. and I cooed over him, cuddled him a little and then we took him to his new home. Nabby and Rufus immediately became jealous when they saw the attention being lavished on Manimal. They liked it even less when they saw Manimal sucking their hair off the floor in entire corgi-sized clumps. The nerve! That's when Rufus lunged at him and tried to take a bite of his shiny, new purple flesh. I can't really blame Rufus for being so mad. He just got here, and all of a sudden this loud, powerful, brilliant sucking machine is upstaging him. Manimal is always hungry. Tomorrow, we are going to test his limits and feed him Henry's car. He's going to be very happy here.